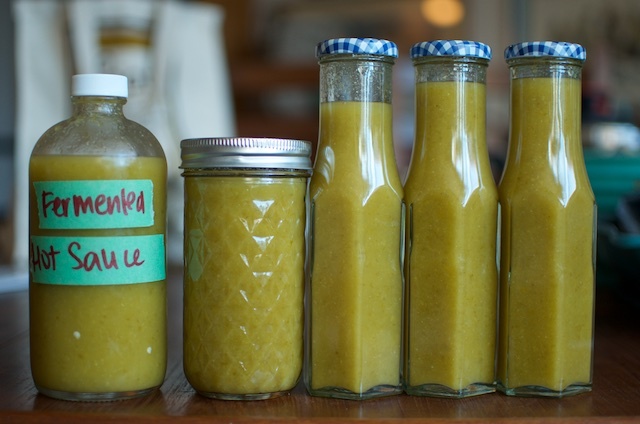 I made my first batch of fermented hot sauce in 2012. It was one of my very earliest fermentation projects and while technically the making of it was uneventful, the finished batch was so incredibly spicy that even one drop gave me immediate heart burn. 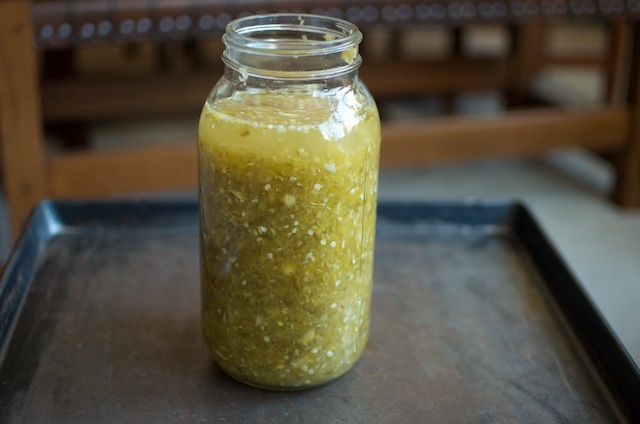 At the time, I figured that homemade hot sauce just for me and moved along. Then last fall, I was visiting Alana and had a chance to taste her hot sauce. It was bright, funky, spicy, and made everything it touched just a bit better. I decided that I’d give making my own another try when next I had the chance. Well, that chance finally came earlier this month. My September Philly Foodworks share included a pound of hot peppers and a pound of sweet. Wanting to avoid my previous error and not make a sauce that would incinerate my digestive track, it appeared to be the perfect combination of ingredients. I took inspiration from a number of sources for my batch. I referenced Alana’s post, took a little inspiration from Well Preserved, and also made sure to see how Amanda over at Phickle does it. (By the way, all three of those bloggers have books coming out soon. Alana’s and Amanda’s books are hitting this month. Joel and Dana’s book will be out in the spring). After reading their various techniques and mixing it up with what I generally know about fermentation, I started my batch. I chose to make a brine (1 quart filtered water and 3 tablespoons fine sea salt) rather than directly salting so that I’d end up with a goodly amount of liquid for my final puree (I like a drippy sauce rather than a chunky one). I combined the peppers (sweet and hot), a full head of garlic (peeled, of course), and a big hunk of ginger in the bowl of my food processor and pulsed until I had a relatively uniform mash. I scraped it into a half gallon jar, added the brine, popped an airlock on top, tucked it into a corner, and forgot about it for a couple weeks. I deemed the sauce finished when it had gone from bright green to olive drab, it was super tangy, and I found myself entirely happy to sip the liquid from a spoon. I divided the sauce into two batches, ran it through the blender, and was done. While different from the sauce that inspired it, it is still bright, tangy, and so, so good. Combine the filtered water and salt in a quart jar and shake it well to help the salt dissolve. Remove stems and cores from peppers and roughly chop them. Heap them in the bowl of a food processor along with the peeled garlic cloves and ginger and process until you have a uniform mash. 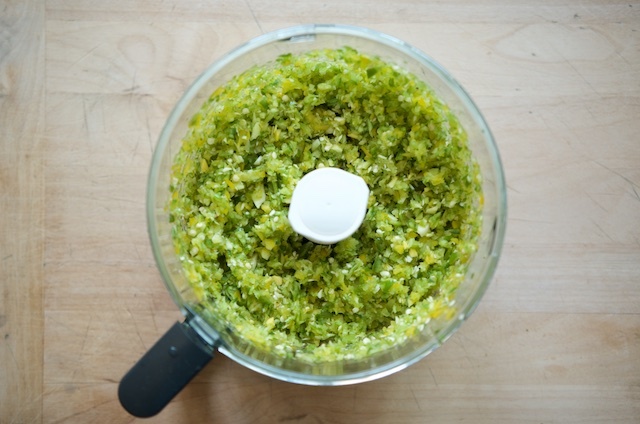 Scrape all the pepper, garlic, and ginger mash into a half gallon jar and pour in the brine. Fit the jar with an airlock of your choice and let it bubble away for two to three weeks, until the color fades and you like how the sauce is tasting. Puree until the sauce has a texture you like. Pour into jars or bottles and stash in the fridge. 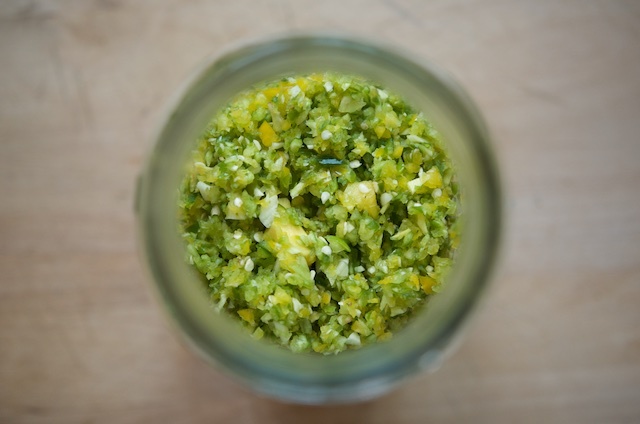 After the fermentation process is finished, the pH of the sauce is typically low enough that you can heat the finished sauce, funnel it into jars, and process it in a boiling water bath canner for 15 minutes if you want it to be shelf stable. 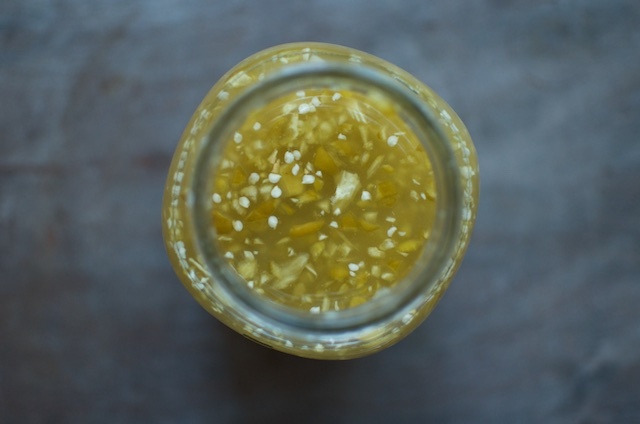 This treatment will kill off the probiotic bacteria in the sauce, but if you can't spare the fridge space for your sauce, it is a way to make it stable and stashable in the pantry. I grew many hot peppers so that I could make hot sauce. I would like to try your fermented hot sauce. Is it possible to half the amount? Thanks so much. Yep. Just divide the recipe in half. Aside from killing the probiotics, would processing this for storage alter the taste at all? I don’t find that processing it changes the taste at all. How long is the shelf life in the refrigerator without processing? 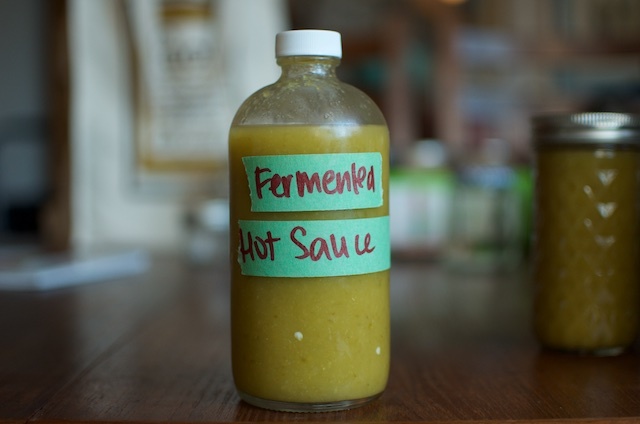 Your fermented hot sauce looks fascinating! Since we Europeans usually are not very familiar with some US household names I just have to ask you to specify “hot peppers”. Are we talking jalapenos here, or maybe birdseye chilis? 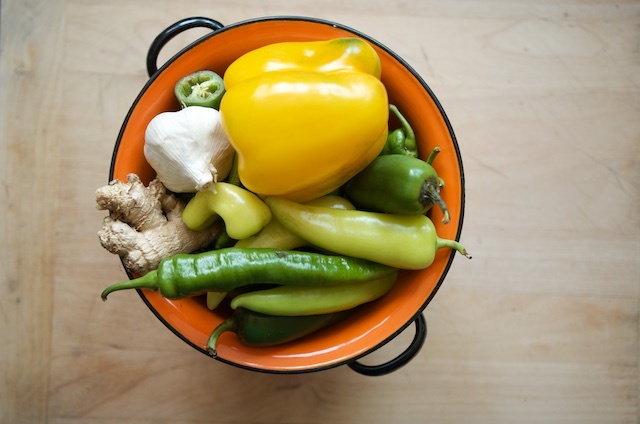 Would you eat whole hot peppers as they come from the supermarket? My favourite chili is Aji Cristal and I would probably try them in this recipe unless I knew different. Please comment – thank you. I used a combination of jalapeno and Italian long hot peppers in this sauce. Any hot pepper that tastes good to you can be used. I set some hot sauce makings to ferment a couple weeks ago and finished them this afternoon. I did a rough chop of the veggies before brining them so I just had to weight them down (no airlock needed). To finish them up today I used a stick blender to puree them and then pushed it all through a sieve. Mine has habaneros, bell peppers, tomatoes, garlic, onions and oregano. I like the idea of a gingery one, also. I might try that next week with carrots and thai peppers. Thanks for the idea! I actually started my hot sauce a couple days ago, but I make about a gallon of it at a time. Thanks for the recipe, this will be great to use the last peppers from the garden, of which I have a bunch waiting for their destination. But wondering about the filtered water, is that because municipal tap water is often treated? I would use our untreated well water, which is better than most bottled waters you can find. – About the hotness of chili peppers: some of my jalapenos were awfully hot this year and I found that seeding them and leaving them in ice water for a while removes quite a bit of the heat. The recommendation of the filtered water is because of treated municipal water. If your well water is good and untreated, feel free to use that! And thanks for the tip on tempering the temperature of the peppers! One more question: I usually use pickling salt, would that work too or is it better to use sea salt here? I feel like fine grain sea salt has some additional mineral content, which I like. However, pickling salt is also fine. Thanks Marisa! I know what I am going to do tonight. I fermented sliced jalapeños a couple of weeks ago and they seem a little slimey. Are they still ok to eat? Thank you, Marisa. I am going to make this great sounding hot sauce. We love the stuff in scrambled eggs and many other foods as well. I have 2 fridges, so will not have to can it. Marisa, I made 2 qts of this recipe, by doubling it, but I think I screwed up the whole thing! I didn’t read about the need for an airlock lid until after I had pureed everything and added the brine. I got on-line an ordered one from a reputable looking site but it probably won’t be here for a few days. Should I just put the pepper mixture in a ziplock gallon size freezer bag until the airlock lid comes? I’ve never fermented anything before and would rather not poison family and friends. Help! It will probably be okay for a couple of days without the airlock. I’d put a two-piece lid on it and then burp the jar a couple of times a day. There’s a higher risk of mold developing when you ferment something like this without an airlock, but chances are good, it’ll be okay until the one you ordered arrives. I’ve got a jar going now, but my veg is floating to the top of the jar instead of sinking to the bottom like yours. Should I worry, stir, run-around-and-scream-and-shout? In the first couple days of fermenting, float is normal. Just give it a stir once or twice a day to keep it from expanding out of the jar. Ours separated quite a bit, is that natural? Should I be mixing it up? The separation is totally natural. Once the sauce is finished, just shake before serving to reintegrate. This sauce is amazing. I want to drink it. We used a mix of aji crystal pepper and some others from the market that the farmer stated were “stupid” hot (versus the “insane” hot ones that I thought would be too much). The fermentation added a tang and also seemed to reduce some of the heat. We let it ferment for 3 weeks at around 75-80 degrees. I’m just wondering if you included some of the seeds from the hot peppers. Omitting them can make the peppers much milder, and this is, after all, hot sauce! I included all the seeds!